© 2019 Gao et al. Background: We have previously combined loss- and gain-of-function approaches to investigate the function of Arabidopsis minichromosome maintenance (MCM) protein subunit 2 (MCM2). However MCM2 loss of function leads to the death of embryos, thus precluding the analysis of homozygous MCM2 mutants. Methods: To further understand the function of MCM2, we generated transgenic tomato plants via RNA interference silencing. And microarray slide hybridization was used to compare gene expression level between LeMCM2 -silenced lines and wild-type plants. Results: We obtained 4 LeMCM2 -silenced lines. The expression level in LeMCM2 -silenced lines was 20-80% of that of wild-type. And LeMCM2 -silenced lines display loss of apical dominance, enhanced chlorophyll accumulation and reduced leaf cell endoduplication. In addition, the expression levels of genes involved in DNA replication was altered in LeMCM2 -silenced lines significantly. Conclusion: In general, the data described here provided additional evidence for the relationship between genes involved in DNA replication and apical dominance and chlorophyll pigmentation. The Arabidopsis MCM2 protein sequence was used to search for tomato MCM2 protein via Sol Genome Network ( https://solgenomics.net/tools/blast/ ) . 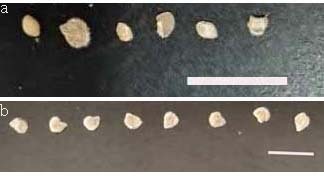 Seed size from the LeMCM2-silenced plants decreased atmaturity. Fraction of ploidylevel of Ln-MCM2-silenced tomatoplants (line 13) and wild-type control plants. Samples were fully expanded leaves (a) and young leaves (b). Ma-ye Gao performed the experiments, analyzed the data, contributed reagents/materials/analysis tools, authored or reviewed drafts of the paper, approved the final draft. Jin Liang performed the experiments, analyzed the data, authored or reviewed drafts of the paper, approved the final draft. Hai-ting Liu performed the experiments, analyzed the data, contributed reagents/materials/analysis tools, authored or reviewed drafts of the paper, approved the final draft. Di-an Ni conceived and designed the experiments, performed the experiments, analyzed the data, contributed reagents/materials/analysis tools, prepared figures and/or tables, authored or reviewed drafts of the paper, approved the final draft. This work was funded by grants from the Innovation Program of Shanghai Municipal Education Commission (13YZ122). The funders had no role in study design, data collection and analysis, decision to publish, or preparation of the manuscript.